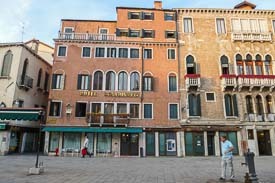 The Hotel Scandinavia Venice occupies an ancient palazzo on one of Venice's most pleasant squares, the Campo Santa Maria Formosa. The location is perfect for sightseeing and shopping, and the hotel is easy to reach (with only two bridges to cross) from the Alilaguna Blue Line airport-boat stop at San Zaccaria. Walk straight ahead past the church. The Hotel Scandinavia will be on your right, facing the square.